The ipico timing chip is attached to my right shoe, my race number is pinned to my running top, my race number is affixed to the appropriate bag, I’ve had pasta for lunch, I’ve got my pasta meal ready for dinner and I can’t actually taste anything. Initially I thought the problem was the bland food at Amano where I had to add salt, pepper and parmesan cheese to my pasta al funghi. While it wasn’t the best dish I’d ever eaten I couldn’t lay the blame entirely with the restaurant. I could eat but I had no appetite and I couldn’t taste much of the food. I walked around the Tate Modern and my lips felt dry. My mouth was dry. Everything felt so slow. Going from picture to sculpture felt like forever. This was my first visit so I forced myself to walk around the free exhibitions and I felt some excitement at the Liechtenstein, Warhol and Bruce Davidson originals. I would have loved to reach out and touch them but no such action took place and then I had to get out of there. I found a Marks and Spencer for some jelly beans, pasta salad and water. Waiting in line was slow. Waiting at the check out was slow. When the woman asked if I wanted the Tate map, I said no thanks I’ve already got one. She looked at Me strangely until I realised that it was my pamphlet she was handing over. I decided that I best just get back and rest. I’ve talked to my parents, had supportive messages from amazing friends and now I’m just waiting. I’m not actively nervous about the London marathon but it’s mainly because I won’t let my thoughts dwell on it for too long. My body however has no problem in suggesting that I take myself out of action for a while. So I’m hiding away until morning and I won’t let myself think about it until I can enjoy it. ’til tomorrow then. 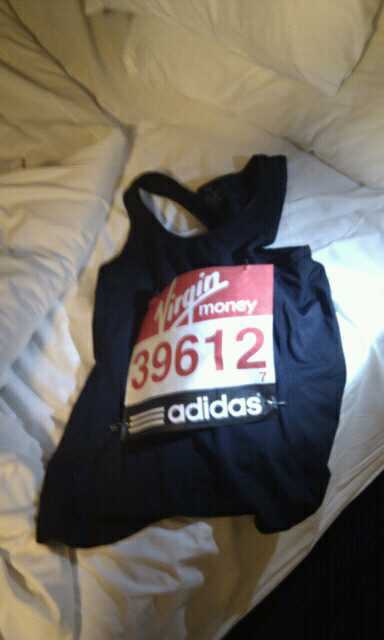 This entry was posted in Running and tagged London Marathon, nerves, Tate modern. Bookmark the permalink. The British Psychological Association last week published a report containing results of their survey of what motivates marathon runners. Their conclusion: People have lots of different reasons for running marathons. I wonder if anyone will ever do a survey into what makes some people state the obvious. Looking forward to reading all about it 🙂 Have a great day and a great run! No worries mate, you’ll be fine, it’ll be an amazing experience!